The power of customer service as a sales strategy should never be overlooked. For customers shopping at Zappos – an online shoe and clothing retailer – it has to be said that there’s nothing particularly special about the prices, nor, perhaps, even the products. And yet, here is a retailer that managed to hit $1 billion in sales in its first 10 years of existence, and now produces in excess of $2 billion in revenues annually. For a company that appears, on the surface at least, to be doing pretty average things, we must ask ourselves – what is it, then, that makes Zappos such a spectacularly special success? Answer: a priority commitment to making customers happy. Zappos’ approach to customer service is certainly unconventional – some have even described it as “insane” and “fanatical”. And such remarks, if a little extreme, are nonetheless hardly surprising. Call center employees endure 4 full weeks of training on how to make customers happy before they actually start handling calls. The agents never use scripts, and they never upsell. In fact, the only thing that’s important to Zappos is one simple thing: that the customer is happy – no matter what. “We are not an average company, our service is not average, and we don’t want our people to be average. We expect every employee to deliver WOW”, the Zappos website states. This is the key philosophy that Zappos employs – and goes at lengths to ensure that each member of its call center team shares. Job candidates are rigorously screened to ensure that their values match up with the retailer’s. Commitment is tested early on through a program which offers all trainees $2,000 to quit at the end of the first week of training – an offer that stands until the end of the fourth week. Zappos only wants people who really want to work for the company – everyone else can take the money and run. The purpose is to create a culture of happy and committed individuals that believe in the Zappos customer service philosophy. In turn, a team whose happiness is taken seriously and is empowered to “do whatever they feel is the right thing to do” will result in producing equally happy and loyal customers. Zappos doesn’t value the processing of high call volumes, nor of quick-time resolution. Nonetheless, each agent is expected to spend at least 80% of their time in customer-facing interactions. Whether this equates to 100 calls a day, or just 1, it doesn’t matter – however long it takes to make each customer happy is time well spent for Zappos. Indeed, Zappos utilizes call center technology to track average call times per agent. However, the goal is not to reduce the average call times – only to ensure that aggregated interactions equate to above the overall 80% mark. Agents who achieve the target receive regular rewards – those that don’t receive additional training. “It’s more important that we make an emotional connection with the customer, rather than just quickly getting them off the phone,” says Derek Carder, customer loyalty operations manager for Zappos. This is a philosophy that has recently been taken to the extreme. Last June, a Zappos employee took a customer service call that lasted a record-breaking 10 hours and 43 minutes. Insane? Fanatical? Maybe, but such accusations perhaps miss the point of what Zappos is trying to achieve – loyalty. 75% of Zappos purchases come from returning customers. And it’s not surprising, considering the over-and-above lengths that the retailer has gone to pleasing those that have done business with the brand. In 2011, Zappos sent a bunch of flowers to a lady who’d ordered 6 pairs of shoes due to her feet being damaged by harsh medical treatments. In the same year, the company sent a free pair of shoes to a best man who had turned up to a wedding shoeless. And in 2015, Zappos decided to deliver a free gift to every household in Hanover, New Hampshire (a town reportedly heavy with customers particularly loyal to Zappos) – nearly 1,900 gift boxes were personally delivered by more than 30 Zappos employees. Such commitment makes Zappos a brand worth talking about, with customers becoming fans and advocates of the brand and telling their friends about the experience. Indeed, in 2009, a very impressive 44% of new Zappos customers heard about the retailer simply by word of mouth. Zappos, it seems, is ahead of its time with its strikingly unconventional approach to customer experience. According to a Walker study, by 2020, customer experience will overtake price and product as the key brand differentiator. Zappos has set a standard that customers are happy to pay for. 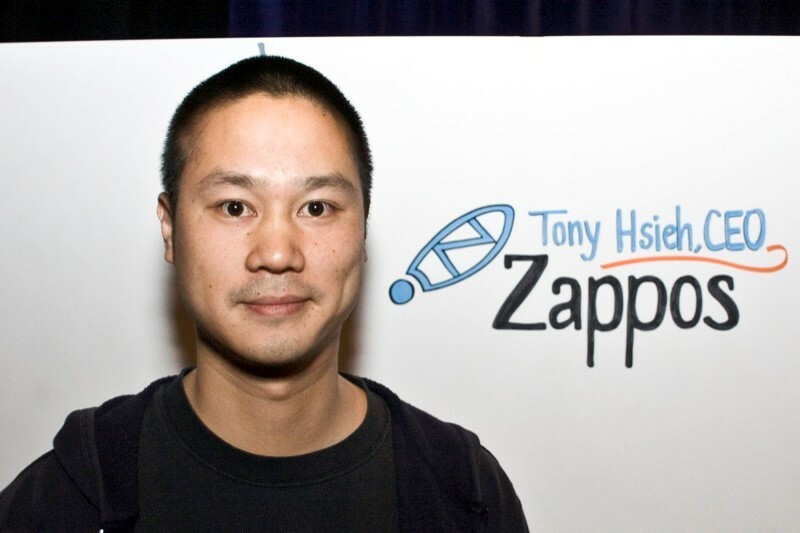 The last word goes to Tony Hsieh, author of Delivering Happiness and Zappos founder and CEO. Make sure to also download the eTail agenda to discover all of the great activities, speakers, & sessions planned for this year.